After considering 70 contenders and testing for over 30 hours, we determined that the Anker PowerPort Solar Lite is the best portable solar charger for people who want to power a phone or small device when in an emergency or off the grid. We also like the RAVPower 15-W Solar Charger, which is marginally more powerful, but a lot less portable. This post was done in partnership with Wirecutter, a buyer’s guide to the best technology. This is a condensed version of The Best Portable Solar Battery Charger; read the full review here. The catch is that these chargers work only with USB devices, which limits their appeal for those who need them for long-term, off-grid setups. If you’re going to be mostly stationary and need to charge or run larger devices like laptops or televisions, or more sophisticated equipment that requires AC power, you’ll probably be more interested in the larger setups from companies like Goal Zero or Suntactics, which we plan to review later this year. In fact, even if you don’t need AC power, you might be better off skipping the solar charger altogether and starting with a USB battery pack. Our large battery pick will keep a smartphone charged every night for a week and is no bigger than a paperback novel. But if you’ll be on the trail for more than a week, you can’t be sure of your power needs, or you want something to tuck into your emergency kit, a solar charger could refill a small battery pack in a day or directly charge a smartphone in two to three hours. The Anker PowerPort Solar Lite is the best portable solar charger because it has the best combination of charging speed, size, and price. Its two-panel design generated almost as much power as our previous three-panel pick (the RAVPower 15-W Solar Charger) and is twice as powerful as the much more expensive Goal Zero Nomad 7. As a result, you get virtually just as much charging capability in a package that is about half the size and weight of our previous pick: The Anker is 18 inches long unfolded and weighs 12.5 ounces compared with the 31-inch long, 23.9-ounce RAVPower. Used alone, the Anker can fully recharge small tablets or one or two smartphones in one sunny day. If you pair the Anker with one of our favorite USB battery packs, the combination will have enough juice to keep your USB-powered gadgets fully charged every day for as long as needed. Though the Anker PowerPort Solar Lite’s measured average (6 watts/1.17 amps) was less than the 15 watts/2.1 amps advertised in the specs, it peaked at 8.48 watts/1.67 amps in direct winter sun, and that real-world performance was in line with the best of the competition. After filling up from the PowerPort all day, our test battery discharged only 15 percent less power than the battery powered by the much larger and heavier RAVPower charger. Beyond power output, the Anker solves an irritating problem common to other chargers. If they get shaded for a moment—from a passing cloud or pedestrian—they can get stuck in a slow-charging state or shut off completely. The Anker and runner-up RAVPower both returned to full-speed charging immediately after being shaded. But two of the panels we tested, including the otherwise-excellent Poweradd, got stuck in a slow-charging state after just a few seconds in the shade. 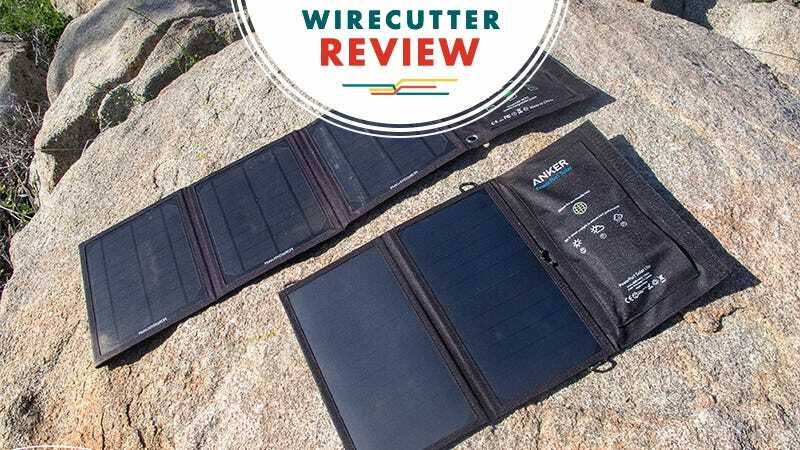 The RAVPower 15-W Solar Charger was our top pick until the new Anker charger came out, and it’s still a good alternative, if a slightly bulkier one. In direct sun, they both produce about the same amount of power—in our tests we measured 1.71 amps from the RAVPower vs. 1.67 amps for the Anker. Under indirect sun—what you’ll likely get in the morning or late afternoon—the RAVPower actually does better, able to pump out 1 amp in the late afternoon when the Anker had already effectively shut down for the night. Over the course of a whole day, though, the RAVPower netted us only 15 percent more energy in our external battery pack—about 500 mAh. That’s enough to provide only an extra 15 to 25 percent for most smartphones—not enough to warrant the size or weight increase.